As the planet earth advances rapidly towards the twenty-first century, people are becoming more aware that the various problems affecting contemporary society cannot be solved exclusively at the national level. Increasingly the world is shrinking in size as distances are shortened and technology advances at a rapid pace. Isolationist policies have no alternative but to fade into the background if real progress with justice is to be attained. No satisfactory and just solution of the numerous problems affecting contemporary society can be achieved without the collaboration of all individuals and nations alike, in particular, the international community. The problems posed by the high level of indebtedness of certain developing countries and their inability to comply with their external obligations after the effective resolution of most of the problems associated with the debt crisis of the 1980s is a prime example of the need for further international cooperation. This paper will discuss the ethical implications of the external debt burden of the developing countries with special emphasis on Latin America and Cuba. The study is divided into seven parts: First, a general discussion of the challenge of the debt crisis and its ethical implications. Second, a review of the origins and magnitude of the debt problems of developing countries. This will be followed with a third part that discusses the steps taken by the international community to address the debt crisis. The fourth part examines Cuba’s external debt service burden. The ethical dimension of the debt crisis and its relationship to development will be discussed in the fifth part. The sixth part analyzes the future implications of the external debt service burden for a free and democratic Cuban government within the context of social justice and in accordance with the principle of solidarity. 2 The last section has the conclusions. The debt crisis of the eighties was of international proportions. It threatened not only the political and socioeconomic well-being of many developing countries but also endangered the very stability of the international financial system. Being a source of concern for the world community, it required the immediate attention of international policy makers. The mere magnitude of its size entailed political, social, and economic implications that could not be brushed aside easily. There was a general consensus that relief from the debt burden was a must, if development was to proceed in an orderly and equitable way. It was generally recognized that the debt crisis concerned not only the authorities of the creditor and debtor nations but, in a particular way, the most neglected sectors of society. A just solution had to be reached; a solution that respected the dignity of the persons affected and minimized the negative consequences of a debt burden that imperiled the development and growth of many a country in both the northern and southern hemispheres. The Pontifical Commission Justitia et Pax issued in December 1986 a set of reflections which called upon all parties concerned with the debt question “to examine the ethical implications of the question of the external debt of developing countries in order to arrive at just solutions that respect the dignity of those who would be most strongly affected by its consequences.” The reflections included in the Commission’s publication, “An Ethical Approach to the International Debt Question,” were the result of John Paul II’s personal involvement with the international debt crisis. The Roman Pontiff advocated for the formulation of criteria to analyze the situation in the light of ethical standards. He insisted that decision makers could not disregard ethical principles in their plans of action to solve the crisis and stressed the need for a greater degree of solidarity between all countries in the international community. The Pope stressed that the debt problem could not be analyzed exclusively in economic, political and technological terms. It must take into account also the need for international collaboration and the pursuit of the common good. However, the final document of the Pa pal Commission did not recommend any specific program of action because it was felt that this would fall outside the Church’s field of competence. The world community did not face the gravity of the situation until it was forced in 1982 with the near default of Mexico. As the world concentrated on the Mexican crisis, little attention was given to the developments that were taking place in Castro’s Cuba. The island’s poor economic performance, caused primarily by the inefficient socialist policies of the Castro regime, was threatened with even greater problems as a result of the significant changes that were rapidly taking place in the former Soviet Union. For many years Castro, following a policy of economic dependence on the Soviet Union and its communist satellites, became increasingly indebted towards his communist partners. It was not until the advent of Gorbachev that the Soviets cut back their economic assistance programs and curtailed their large subsidies to the Cuban economy. After the fall of communism, Cuba’s need for increased economic and financial relations with the industrialized free market economies became quite evident. But, this also meant a correspondent increase in the islands foreign debt in freely convertible currency. Already by 1982, Cuba’s debt in freely convertible currency had reached $2.9 billion, not counting Castro’s high level of indebtedness towards the former Soviet empire. Mexico, among others, was not the only country on the verge of bankruptcy. Cuba was another heavily indebted countries at the brink of bankruptcy. The Organization of Petroleum Exporting Countries (OPEC) price cartel triggered a series of events in 1973 that led eventually to the debt crisis. The massive oil surpluses of the oil producing countries, which were deposited in European and American banks, were recycled and lent to developing countries to provide balance of payments support and help expand their import level. The abundance of liquidity held by the international capital market, together with the prevailing low interest rates, fueled the continuous economic expansion that took place during the early and mid-seventies. The commercial banks were more than willing to lend their excess funds to the eager borrowers from Latin America and other developing countries. The developing countries constituted an ideal loan clientele for the international capital market, in particular those with a growing industrial sector. The Latin American countries, many hard hit by the sharp increase in oil prices and excessive government spending, resorted to financing their external disequilibrium by borrowing in the international capital market. On the other hand, the industrialized countries and some developing countries outside Latin America reacted to the “oil shock” by adjusting their economies and reducing their current account deficits promptly even at the price of lower growth rates. The recession in the industrialized countries resulted in a drop in the demand for the exports of developing countries which was reflected in a decline in the prices of raw materials. The problems of developing countries were compounded by a drying up of commercial credit which they had enjoyed for many years and soaring interest rates. While negative external factors such as the world recession and the high interest rates contributed to the development of the debt crisis, economic mismanagement in developing countries also played a major role in the debt crisis. Excessive spending, together with lax monetary policies that included the monetary financing of fiscal deficits, increased price pressures, eroded competitiveness, and widened balance of payments deficits to unsustainable levels. The only way out of the crisis was a major tightening of fiscal and monetary policies accompanied by a program of structural reforms to establish the basis for stability and sustainable economic growth. The long-term debt of developing countries (including public, publicly-guaranteed and private nonguaranteed debt) amounted to US$62 billion in 1970, and for Latin American and Caribbean countries it was US$26 billion. 6 By 1980, long-term debt of developing countries had increased to US$480 billion, an almost eight-fold increase, and short-term debt amounted to US$165 billion (the comparable figures for Latin American and Caribbean countries were US$187 billion and US$69 billion, respectively). Total debt service as a percentage of exports of goods and services for Latin American and Caribbean countries had reached almost 36 percent by 1980 (compared to only 13.3 percent for all developing countries). This ratio peaked at 38 percent in 1988. An international debt strategy was developed over time by the governments of major creditor countries and multilateral organizations to address the external debt problems that erupted with the 1982 Mexican crisis. Actions were taken to address the problems associated with the servicing of the debt to commercial bank creditors as well as with the debt to official creditors. The strategy to deal with the debt to commercial bank creditors had three goals: avoidance of a collapse of the international banking and financial systems, minimization of economic dislocation in debtor countries, and restoration of the access of heavily indebted countries to capital markets. William Cline has argued that, overall, the strategy succeeded well on the first and third objectives. In his opinion the results on the second objective were more disappointing, but he acknowledges that the strategy encouraged domestic policy reforms that eventually paid-off in terms of stability and economic growth. Many of the structural reforms that were initiated would have need to be carried out even without the debt crisis. With regard to the international debt strategy to address the problems associated with debt to private banks, there were three distinct phases to the strategy: emergency lending to Mexico and subsequent coordinated lending to other individual countries (1982-85); the indicative Baker Plan, which set targets for bank and official lending and called for structural reform in debtor economies (1986-88); and the Brady Plan, emphasizing debt reduction agreements (1989-1994). The first phase consisted of involuntary lending by banks, orchestrated by the International Monetary Fund (IMF), with the central premise being that the debt problem was not one of insolvency, so that further lending was appropriate. Multiyear rescheduling agreements (MYRAs) were initiated at this time. By 1985, however, it became apparent that voluntary lending was not returning. Imports had been compressed severely and the return to civilian governments in Argentina and Brazil increased the political urgency of addressing more adequately the debt crisis. In late 1985, the Baker Plan was announced. The plan, named after the Secretary of the Treasury of the United States, established indicative targets for lending from commercial banks and multilateral banks in exchange for policy reforms to improve fiscal balances, liberalize import regimes and direct investment, and privatize public sector assets. Some experimentation was done with market based debt reduction. Moreover, the amount of financing made available under the plan did not reach the levels envisaged. The situation was complicated with the collapse of oil prices in 1986. As a result, prospects for key debtors such as Mexico and Venezuela changed from solvency to potential solvency. By 1987 there had been a widespread provisioning by banks against possible losses on their loans to developing countries. This influenced secondary market prices of developing countries debt which fell from about 70 cent on the dollar to about 35 cents by 1989. The combination of these two factors provided an opportunity to implement financial workouts that involved a trade of some portion of the face value of bank claims in exchange for increased security through officially aided collateralization. A growing divergence of interest among the banks, and the increasing reluctance of European, Japanese and regional U.S. banks to lend new money also compromised the Baker Plan. To address these problems, by 1988 a menu approach was being offered to banks under which banks would exit by converting claims to concessional bonds, while others would continue the new-money strategy with the aid of such devices as new-money bonds. There also was a growing frustration among policy makers of creditor countries that the public share of debt was rising and that of the banks was failing, even though the trend was a return to patterns predating the unusual petrodollar recycling of the 1970s and still left the bank exposure far higher than that of the public sector. In March 1989 the new U.S. Treasury Secretary Nicholas Brady announced the next phase of the debt strategy which emphasized debt and debt service reduction. The Brady Plan introduced public sector collateral as the catalyst to convince banks to reduce their existing claims on debtor countries. The plan also envisaged additional new money lending by those banks that preferred this option. An additional inducement to the plan was that the IMF was willing to lend to countries that had arrears to banks. Previously, the IMF had not lent to countries until they had reached an agreement with the respective banks. The Brady Plan was quasi-voluntary as the previous plan because it incorporated the alternative of new money and it was market oriented in that the depth of debt reduction typically negotiated was commensurate with the existing secondary market price on the one hand and the extent of collateralization of the replacement claims on the other. Moreover, the Brady Plan had a case-by-case approach and was conditional on policy reform. 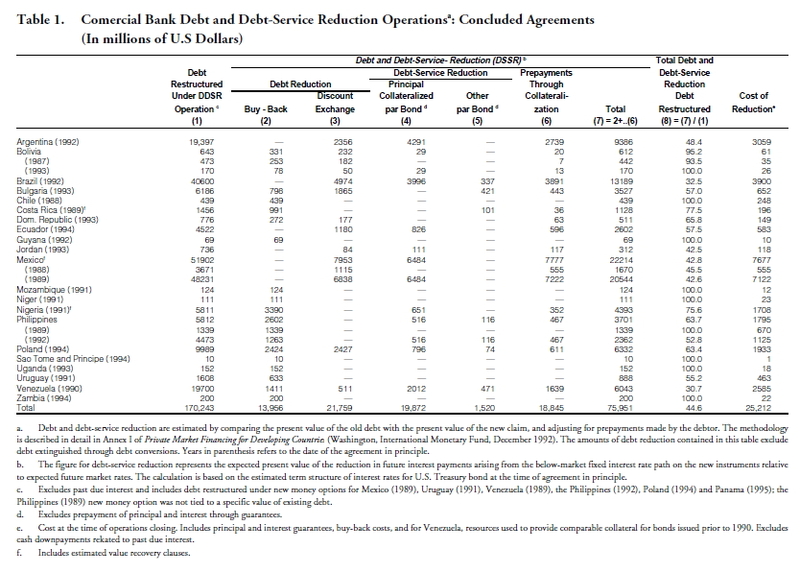 Information compiled by IMF staff shows that by the end of June 1995, 21 countries had completed deals that restructured commercial bank debts with a face value of US$170 billion, obtaining roughly US$76 billion in total debt and debt service reduction in present value terms at a cost of US$25 billion (Table 1). 7 Allocation to the options in the various debt packages have differed, reflecting in some cases explicit limits and the views of the holders of the debt regarding the expected future values of the debt instruments issued in exchange for the old bank claims. The cost per unit of debt reduction achieved (the buyback equivalent price) has been roughly in line with the secondary market price of the bank claims at the time of the agreement in principle, and thus as a whole have been cost efficient. Net capital inflows to Latin America, which had fallen from an average of about US$55 billion in 198081 to approximately an average of US$5 billion annually during the period 1983-89, rebounded to nearly US$55 billion during the early 1990s. This turnaround in capital inflows reflected a more favorable domestic environment for foreign investment. As a result, the size of debt relief associated with the Brady Plan became less urgent and relatively smaller. Particularly noteworthy has been the improvement in direct and portfolio investment in the early 1990s. The adoption of a quasi-voluntary, market-oriented approach to debt forgiveness was important in generating this positive market perception of Brady countries and other developing countries. The second prong of the international community debt strategy dealt with the debt to official bilateral creditors. Since 1980, 65 countries have rescheduled their official bilateral debt under the aegis of the Paris Club (Table 2). The Club has neither a fixed membership nor an institutional structure; rather it represents a set of practices and procedures that has evolved since the first ad hoc meeting for Argentina in 1956. Meetings are open to all official creditors that accept those practices and procedures. 8 Official creditors require two preconditions for the initiation of a debt renegotiation: First, that the debtor country will be unable to meet its external payments obligations unless it receives debt relief and, second, that the debtor country will take the steps necessary to eliminate the causes of its payments difficulties and to achieve a durable improvement in its external payments position. Creditors have relied on the IMF to help member countries design appropriate adjustment measures and generally require that a Fund program be in place before the debt renegotiations are initiated. Official debt reschedulings typically cover both principal and interest payments on mediumand longterm debt falling due during a given period (the consolidation period); where necessary, creditors may also cover payments already in arrears at the beginning of the consolidation period, especially with countries undertaking reschedulings with official creditors for the first time. Paris Club reschedulings have generally paralleled the sharp rise in commercial bank restructuring but were less concentrated at the onset of the debt crisis in 1982. This reflected the more diversified experience of countries largely indebted to official creditors, in part because these creditors did not abruptly change their lending practices. Fifteen countries had approached the Paris Club already during the 1976-82 period, prior to the emergence of more widespread debt-servicing difficulties. During the following three years, 1983-85, nineteen other countries obtained Paris Club reschedulings, mostly middle-income countries with large debts to private creditors. From 1986 through 1993 another twenty-four countries required reschedulings in the Paris Club. Most of the rescheduling countries have returned to the Paris Club several times and progress in resolving debt servicing difficulties to official creditors through successive reschedulings has remained slow. Less than half of the 65 countries that have required reschedulings have resumed normal relations with bilateral creditors. Successful graduates from the Paris Club reschedulings process have been mostly those middle-income countries that had been predominantly indebted to private creditors. Their success has been based on the sustained implementation of macroeconomic and structural reform policies, often accompanied by comprehensive commercial bank debt restructurings. However, for the other middle income countries that currently continue to require cash-flow relief from Paris Club creditors, prospects are presently generally favorable. The debt situation of the low income rescheduling countries (most of which are in sub-Saharan Africa) has remained more difficult. This has led them to rely on protracted debt reschedulings. The difficulties have been associated with a sharp deterioration in their terms of trade. Difficulties in adjusting to the deterioration to the terms of trade were usually accompanied by the accumulation of external arrears which undermined the efforts of these countries to re-establish creditworthiness and reduced their access to new financing from official sources. As countries found themselves unable to meet the obligations arising from previous reschedulings, they required increasingly comprehensive cash-flow relief. In late 1988, creditors took a first step toward reducing the future debt-service burden resulting from successive reschedulings. Agreement was reached to implement a menu of options (the Toronto terms) which included elements of debt and debt-service reduction. Rescheduling under Toronto terms provid ed an average grant element of well over 20 percent for nonconcessional debt. However, it was soon clear to creditors that the vast majority of low-income rescheduling countries required more far reaching concessions for a sustained improvement in their debt situation. In December 1991, Paris Club creditors reached agreement in the modalities of implementing deeper concessions for the low-income countries. The new approach combined the flexibility of the flow approach during the adjustment period with the possibility of a later stock-of-debt operation that could provide a definitive resolution of the debt problem . The new menu of enhanced concessions identified as the London terms provided for 50 percent reduction (in net present value terms) of debt service consolidated on non-official development assistance debts. The rescheduling agreements based on the new menu contained the provision that Paris Club creditors would be willing to consider the matter of the stock of debt after a period of 3-4 years. 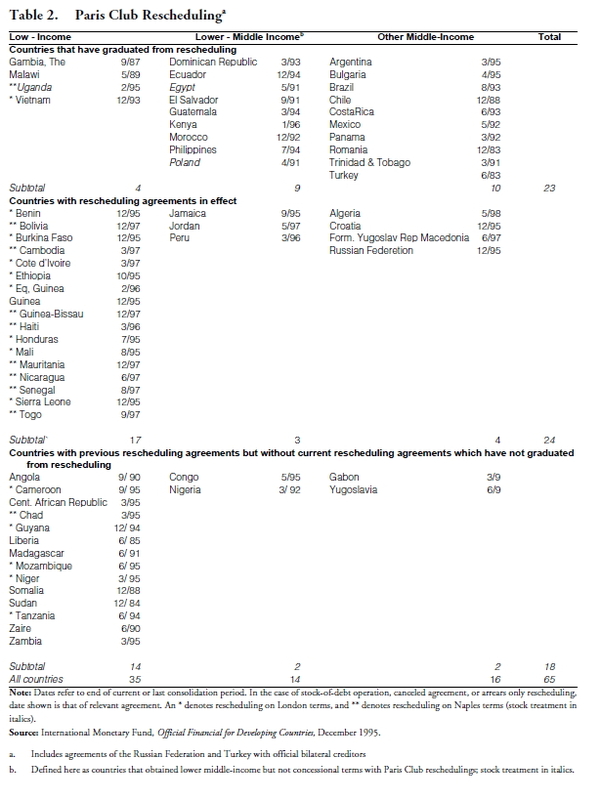 Some 17 low-income countries concluded agreements during 1992-94 with the Paris Club creditors with enhanced concessions. During 1994 and 1995 more progress was made in graduating countries from Paris Club reschedulings. Seven middle-income countries did so, bringing to 23 the countries which have graduated from the Paris Club out of a total of 65 countries that have required Paris Club reschedulings (Table 2). A majority of the remaining middle-income countries with agreements now in force are expected to graduate at the end of their current consolidation period. The debt situation for of the very low-income rescheduling countries remains difficult despite repeated reschedulings over the past several years.In recognition of their heavy debt service burden, Paris Club creditors adopted the Naples terms in December 1994. According to these terms, the level of concessionality was increased to 67 percent in net present value terms compared with 50 percent under London terms. As under the previous reschedulings on London terms, agreements under Naples terms also feature a goodwill clause referring to a stock-of-debt operation after a period of three years of good performance under both IMF arrangements and the rescheduling agreement. As a result of these efforts to reduce the debt and the debt service obligations on external debt to private and official creditors, the debt service pressures on Latin America have been alleviated. World Bank debt data show that for Latin America and the Caribbean the ratio of total external debt to GNP, which had risen from 36 percent in 1980 to 66 percent of GNP in 1987, began to decline in 1988. 9 By 1994 the ratio was back to the level of 1980: 36 percent of GNP. 10 The ratio of total debt service for Latin America and the Caribbean as a percent of exports of goods and services also peaked in 1988 at 38 percent and it declined to less than 29 percent in 1994, reflecting in part the restructuring of the debt. By 1994 the public and publicly-guaranteed external debt of Latin America and the Caribbean was US$380 billion or about 87 percent of the total long term debt of the region. About 18 percent of the US$380 billion debt was owed to multilateral creditors and about 26 percent was owed to foreign governments. Debt to private creditors accounted for the remaining 56 percent of the public and publicly guaranteed debt of Latin American and the Caribbean in 1994. The newly adopted measures taken by the international community, together with the significant changes in economic policy that have taken place within Latin America, are likely to continue to have positive effects and permit the countries of the region to attain higher levels of sustained economic growth. However, as a recent report of the Inter-American Development Bank notes, Latin America still exhibits an excessive dependency upon external savings, which should be replaced by the use of private internal savings in order to raise investment. At the same time, the regions new openness to world trade must be accompanied by a major effort to increase exports in order to ensure the viability of this important process. This will require the elimination of legal, institutional, and tax-related limitations that hamper exports. 11 Notwithstanding the progress made in recent years, there is a group of heavily-indebted-countries (mostly outside Latin America) which are likely to continue to experience serious debt-servicing problems and they face the challenging task of formulating a satisfactory adjustment policy. They must achieve a significant improvement in their external current accounts balance while at the same time reviving the confidence of domestic and foreign investors in the viability of their economies. Access to Naples terms to reschedule their debt to bilateral official creditors would no doubt help them, but they still need to adopt domestic measures to attain sustained economic growth together with political and social stability. Otherwise they will find it extremely difficult, if not impossible, to overcome the vicious circle in which they now find themselves. It is possible that a country, such as Cuba, after many years of inefficient economic policies, will face such a large external debt service burden that it will be very painful (and politically impossible) to apply the adjustment measures necessary to service fully its debt. The debt outstanding may be so large that the repayment of arrears and debt service obligations would make it impossible for the country to invest and grow. Under such circumstances it would be in the interest of both creditors and Cuba to restructure the debt in a way that would permit the countrys required long-term growth. Once Cuba reinserts itself in the international economy, it would also be able to reduce its debt service burden through export expansion to markets reopened to it. Ever since the very early stages of the revolution, the Cuban government embraced the principles of Marxism-Leninism and embarked on a policy of total political and economic centralization. It rejected all the basic postulates of the market economy and forced the country into a new era of “real” socialism, 12 in accordance with the former Soviet model. In the international arena, Havana’s totalitarian regime turned its back on its former allies and friends — in particular the United States— and initiated a policy of alliances and economic agreements with Moscow, Eastern Europe and other communist bloc countries. The Government’s increasing dependence on the common market of the socialist economies, the Council for Mutual Economic Assistance (COMECON), together with its dismal record on human rights violations and external military adventures, contributed in no small matter to its gradual isolation from the western democracies and the major international financial institutions. Havana’s major and almost exclusive source of financial assistance was reduced to Moscow and its communist allies. This misguided policy of dependence proved to be disastrous with the collapse of the Soviet Union. It was only then that Castro was forced to look for new sources of financial assistance in the western capitalist democracies in order to find relief from his outstanding external obligations, primarily a consequence of the inefficient economic policies of his failed socialist experiment. Cuba’s external debt in freely convertible currency in 1969 amounted to only 291 million pesos, but as noted earlier, by 1982 it had reached 2.9 billion pesos. 13 During the 1980s Cuba also tried to reschedule its external debt. In 1982, Cuba requested from its creditors the renegotiation of the medium-term debts maturing between September 1982 and December 1985, and the postponement of these payments for a period of 10 years, including a three-year grace period. 14 During the following years further negotiations took place between the Cuban government and its foreign creditors, but with mixed results. The economic situation continued to deteriorate and in 1986 the conditions for paying the debt service worsened to such a degree that Cuba was no longer able to meet its international obligations. Since 1986, the Cuban government has not been able to normalize its financial relations with bilateral creditors and foreign banks. No estimate is available of Cuba’s GNP in 1994 in current market prices and, because of this, it is difficult to assess the relative size of the countrys external debt in freely convertible currency. In the report of the Banco Nacional de Cuba, the 1994 GDP is reported at 12.9 billion pesos (in 1981 prices). This represents a drastic fall from the GDPs of the years 1989 and 1990 which were approximately 19.6 and 19.0 billion pesos, respectively. However, it is clear that the relative size of the external debt of Cuba is quite large. Assuming that the official GDP estimate for 1994 in 1981 prices was a reliable one, and that the GDP in current market prices increased by 50 percent between 1981 and 1994 (an average price increase of 3 percent per year during this period), the amount of freely convertible debt of 9.1 billion pesos would have been equivalent to 50 percent of GDP, significantly higher than the ratio of 36 percent of GNP for Latin American countries and the Caribbean. The poor showing of Cuba’s exports in recent years also has made it more difficult for the country to service its external debt. Cuban exports (fob) fell from 5.4 billion pesos in 1989 to 1.1 billion pesos in 1993 and to an estimated 1.3 billion and 1.5 billion pesos in 1994 and 1995, respectively. 16 For illustrative purposes, if one assumes that about 1/10 of the principal of the freely convertible debt would have fallen due in 1994 and that Cuba would have had to pay an interest rate of about 7.5 percent on its debt (one-year LIBOR averaged about 5.5 percent in 1994), the total debt service payments would have been about US$1.5 billion, equivalent to almost 70 percent of exports of goods and services of Cuba in 1994 as reported by the Banco Nacional de Cuba. This is a debt service ratio more than twice the average for Latin America and the Caribbean. Obviously, no mention is made in official Cuban documents of the disastrous socialist economic policies followed by the Castro government. Neither is there any reference made of the government’s total rejection of market forces nor of the inefficiency of bureaucratic management and other misdirected government expenditures. Without the incentive of profits, production will almost inevitably tend to decrease and the potential for economic growth stifled, as the Soviet experience has amply demonstrated. The recognition of the right to private property, including the right of ownership of the means of production, is a necessary prerequisite for a sustained and integral development. Since the end of the Second World War, the growing awareness of the tremendous economic differences that exist between the developed and developing countries have shifted, to a certain extent, the center of the social question from the national level to the international level. The debt crisis of the 1980s was the most recent indication of the interdependence between developed and developing countries and the need for a greater degree of cooperation and understanding within the world community. The centers of economic and social power gradually began to realize that a just and sustained development in the poverty stricken nations of the world would contribute not only to their own economic growth and development but also to the moral, cultural, and economic growth of the entire human race. The Mexican crisis reinforced this realization when the more developed countries had to intervene and take emergency measures to avoid a possible collapse of the international financial system with its negative consequences on growth and development. The complexity of the debt crisis of the 1980s has demonstrated the need for solutions that go beyond temporary agreements between creditor and debtor nations. The solution cannot be limited to a simple debate as to whom or how the payment or non-payment of the debt should be made. A deeper analysis of the very roots of the crisis is required in order to prevent the recurrence of some of the economic problems that led to the lamentable events of the 1970s and 1980s. This leads us directly to the concept of development and the need for international cooperation. Pope John Paul II clarifies the principle of solidarity when he states that the very reality of interdependence “must be transformed into solidarity, based upon the principle that the goods of creation are meant for all.” 26 In other words, solidarity “helps us to see the other— whether a person, people or nation— not just as some kind of instrument, with a work capacity and physical strength to be exploited at low cost and then discarded when no longer useful, but as our “neighbor,” a “helper” to be made a sharer, on a par with ourselves…” 27 The validity of the principle of solidarity, both in the internal and in the international order, is one of the fundamental principles of the Christian view of social and political organization. It should not be viewed as being in contradiction with a market economy which in the social justice tradition of the Church is viewed as the most efficient economic system and in line with the respect to the right of private property. 28 The principle of solidarity, does call, however, to take action to help the disadvantaged and to ensure that the poor have the means for participating in the process of development. The Pope also stresses the need “for effective international agencies which will oversee and direct the economy toward the common good, something that an individual State, even if it were the most powerful on earth, would not be in a position to do.” 29 Decision makers, both at the national and international levels, cannot ignore the phenomenon of globalization and the obligation it entails if the common good of all nations is to be attained. Solidarity requires an awareness and acceptance of co-responsibility for the causes and solutions of the debt question; solutions that must be found if every nations right to development is to be respected. With respect to the causes, they can be either external or internal or both, depending on each specific case. Very often, the problem is the result of internal conditions, caused by inefficient economic or political systems which hamper economic growth and development. Other times, the cause can be traced to international market factors or protectionist policies carried out by the industrialized nations. The important lesson that can be learned from the debt crisis is the need for an agreement on an equitable sharing of the adjustment efforts and of the sacrifices that must be made in order to solve the problem. But, above all, the international community must realize that peoples and nations have a right to develop. As long as large sections of the world population live in abject poverty and suffer the scourge of under development, no durable solution will be found to the debt problem. The severe affliction of underdevelopment cannot be treated with small doses of aspirin. It demands a more profound cure that requires painful adjustments and sacrifices on the part of both the creditor and debtor nations. Fortunately, as it has been described in the third section of this paper, the steps taken by the international community to address the debt crisis reflect the spirit of solidarity and a realization of the interdependence of creditors and debtors. Faced with the reality that debtors could not meet their obligations, creditors have provided debt relief in exchange for the adoption of meaningful economic reforms in debtor countries. In the particular case of Cuba, what type of cure will the new government have to apply once freedom and the rule of law are restored on the island? Will a free Cuba need the cooperation and assistance of the international community in order to reduce the burden of its debt and help reconstruct the countrys devastated economy after years of inefficient marxist-socialist policies? Does the international community have a shared responsibility in the reconstruction of Cuba in accordance with the principle of solidarity? An attempt will be made to answer these questions in the section that follows. Hopefully, with the end of Castro’s Marxist-Leninist regime, a new era of political and economic freedoms will begin. It is highly probable that Cuba’s centralized socialist economy will be replaced by a more liberal economy where the market system will prevail and the right to private property and human rights respected. However, the newly installed government will have to face the inherited formidable burden of an external debt in freely convertible currency which, as already indicated, amounts to over US$9 billion without counting the debt to Russia. The new Cuban government will have to confront the important task of determining how to deal with its large external debt. This is a matter of importance for both Cuba and its creditors. Given its very large debt, Cuba will need all the cooperation it can get from the international community so that the transition period to a market economy can result in a process of genuine development as quickly as possible. To renegotiate and reschedule in the best possible terms the islands debt to its foreign creditors will be among the governments top priority goals. Total repudiation of the external debt that has not been serviced for approximately 10 years is probably not a realistic option for a new Cuban government. The costs of a default would be great in both economic and ethical terms. Defaulting, as Professor Gerald M. Meier of Stanford University has stated, “entails the cost of losing future access to international markets, not being able to receive trade credits, having its assets possibly subject to assessment by the creditors, and suffering in general a loss of reputation.” 33 Cuba’s new democratic government could ill afford to begin a new era of respectability by defaulting or refusing to pay its debts, even though they were incurred by the previous Marxist regime. It is highly probable that a democratic government committed to carry out economic reforms would be likely to receive a sympathetic treatment from its foreign creditors. Creditors may conclude that if debt and debt-servicing reduction, as well as new financing, are given to Cuba, the island’s economy will prosper and will become creditworthy in the future. Countries that have embarked on adjustment programs and implemented structural reforms with the support of multilateral institutions have had substantial debt relief. However, given its debt service burden, the extent of debt relief that Cuba would need to receive would be extensive if it is going to restore its relations with foreign creditors, even if new sources of financing such as from multilateral institutions, are opened again to Cuba. A reduction of Cuba’s large external debt would give the country a greater incentive to service the smaller debt and to implement measures to stimulate the domestic economy. The debt and debt service reduction should be sufficient to enable Cuba to bring the stock of its debt down to a level that is manageable given the size of the economy and export capacity. In addition, it should be sufficient to permit part of Cuba’s future income growth to accrue to domestic residents and not just to foreign creditors, and sufficient to permit trade lines and interbank lines to be maintained on a voluntary basis. There is always, of course, the unlikely possibility that the creditors may decide to forgive in its totality the debt burden of a debtor country. However, concerning total forgiveness there is the more crucial question, apart from economic consideration, of how just or ethical it would be to forgive the debt of certain countries and not of others. In addition, a dangerous precedent would be established whereby any country would be inclined to borrow with the near conviction that sooner or later its debts would be forgiven in order to avoid, for example, an international crisis. In the final analysis, how the creditor nations will react once Cuba enters a new democratic phase in its history is impossible to predict with absolute certainty. It seems fair to state that Cuba will be able to overcome many of its present difficulties and reinitiate a path of economic growth and development if it endorses the basic principles of the free enterprise system and fosters the common good and accepts democratic principles. Cuba is endowed with good natural and human resources that could be used in a more efficient manner once the proper incentives are provided in an environment of freedom and justice. As soon as confidence in the future of Cuba is reestablished and the countrys trustworthiness restored, the international community is likely to come to its assistance. In particular, the inflow of private foreign capital could be significant and more than willing to take advantage of the multiple opportunities that the Cuban market will offer foreign investors. During Cuba’s difficult transition period the new government will need the full cooperation and assistance of the world community. It is precisely during the transition period that multilateral institutions can and should play a significant role in the countrys economic recovery. They should come to the assistance of the new Cuban government and help it to renegotiate and/or reschedule many of the debts owed by the Castro regime. Neither can the wealthier nations shy away from their responsibility to help a free Cuba in its efforts to recover from the deprivations of the past. To do otherwise would be to ignore the principle of international solidarity. Cuba suffered too much under Marxism to be ignored by the world community. Obviously, such a favorable outcome might be deemed too optimistic. Other countries that have endured Marxist policies for many years have found it very difficult to pass from economic collectivism to economic freedom without serious economic problems. The period of transition, as the Russian example clearly demonstrates, is full of perils. A long tradition of dependence on government can very easily wither away the incipient desire for freedom. History tends to indicate that there is an inverse relationship between freedom and dependence. The greater the level of dependence, the lesser the degree of freedom and vice versa. That is why the transition from total dependence on the state to individual freedom can be extremely hazardous if the latter is not accompanied with a large dose of personal responsibility on the part of all sectors of society: public and private. It is a proven fact that the abuse of freedom can destroy the chances for success of even the best political or economic systems. Ironically, it is precisely in this area of political and economic freedom that lies the greatest danger facing Cuba’s post communist era. The changes that will have to be introduced if Cuba’s ills are to be cured will require many painful adjustments that all sectors of Cuban society will have to accept and endure, not only the less privileged groups. This may not be easy to carry out in a democratic and free environment unless everyone rich and poorare willing to accept the changes and act in a responsible manner. The new Cuban society must be built on responsible freedom and with a great dose of solidarity; a solidarity that will bind all Cubans together in a continuous search for the common good of the country. Otherwise Cuba could fall back into chaos and some other type of totalitarianism, whether of the right or of the left. It is to be hoped that Cubans, with their long history of private initiative and love of freedom, will not be led astray by a false sense of dependence on government, so characteristic of the Castro years, and use instead their newly acquired freedom in a responsible and constructive way. The Cuban people will surely accept and support the long awaited economic changes of the post communist era as long as they are carried out with justice and provide the necessary safeguards for the underprivileged sectors of society. There is a growing interdependence between peoples and nations which should be used to pursue the objectives of the common good and not limited to individual or collective vested interests. Interdependence can give rise to new and broader expressions of solidarity; a solidarity which respects the dignity of the human person and fosters the development of both individuals and nations. A clear manifestation of the interdependence between developed and developing countries are the problems associated with the growth of the external debt of developing countries. In many cases, their solution requires genuine cooperation at the international level which can provide for an efficient management of debt problems and help foster the economic recovery of the indebted countries. But, for authentic development to take place all the nations of the world must participate; not only the more wealthy ones. Fortunately, as demonstrated in this paper, important steps are already being taken to alleviate the external debt service burden of heavily indebted countries. What will happen to Cuba in the post socialist era cannot be predicted with any degree of certainty. The probability weighs heavily in favor of the post Castro government dismantling the entire apparatus of Marxism-Leninism, responsible for the penury that has afflicted the Cuban population for so many years. The apparent heirs are democratic pluralism and the free market system. The fall of Marxism in the former Soviet Union contributed in no small manner to the reality of interdependence among peoples and intensified the free flow of ideas, not to mention the flow of capital and other factors of production. The flow of capital into Russia after the fall of the Berlin wall in 1989 set the example for future types of assistance to former communist countries that have endorsed political and economic freedoms. Renegotiation and rescheduling of its foreign debt in equitable terms similar to those received by other countries of similar level of development and debt indebtedness will be among the top priorities of the incoming authorities. Cuba must become once again a trustworthy nation, gain the respect of the world community and meets its international obligations. But, at the same time, both the creditor nations and the international financial institutions must show a deep understanding of Cuba’s needs and help the country to recover from the dismal policies of communism. Such a willingness to cooperate in the reconstruction of Cuba’s devastated economy would be proof enough that the international community takes the principle of solidarity seriously. While it is true that the free market system can achieve a higher standard of living than collectivism in any of its forms, it is false to assume that economic and political freedoms per se will contribute also to a better and more humane society. There is little doubt that the capitalist model is by far more efficient and productive than socialism but there is no guarantee that the former will not exclude also all spiritual principles and deny an autonomous existence and value to morality, law, culture and religion. If it does, the difference between capitalism and Marxism tends to fade away because both systems would reduce man to the sphere of economics and the satisfaction of material goods. Cuba has to be rebuilt morally and economically and, as in the case of all former communist dominated countries, will need to go through a patient material and moral reconstruction, even as people, exhausted by longstanding privation will be asking the new government for tangible and immediate results in the form of material benefits and an adequate fulfillment of their legitimate aspirations. Cuba’s long suffering people will some day experience the fall of Marxism-Leninism and, hopefully, experience a new era of peace and justice for all Cubans of goodwill. But Cubans should not expect the immediate improvement in living standards after the long night of Castro’s dictatorial experiment. Recent experience has demonstrated that the simple overthrow of prevailing socioeconomic structures have not necessarily brought about the “panaceas” that their sponsors had predicted. Progress does not always follow change “per se.” Change will be successful only if the economic and technical aspects of the change are accompanied by a proper ethical foundation. Without such a foundation, the needed politi cal and economic changes will falter and the problems will only intensify to the detriment of the Cuban people. Cubans should look to the future with optimism. As the bonds of solidarity increase, both at the national and international levels, the problems related with the foreign debt will fade into the background and finally the Cuban people will be able to enjoy a well deserved integral development.